Series I savings bonds enjoy several tax benefits that are unavailable to most other fixed-income investments. First, let's cover the basics of I bond taxation before getting into special exemptions. Series I savings bonds are not subject to state or local taxes. When you invest in Series I savings bonds, you won't pay taxes on the interest income you earn to your state or local government. This means more money ends up in your pocket at the end of every year than if you owned an ordinary bond. Series I savings bonds are subject to Federal taxes. When you buy your Series I savings bonds, you will owe the Federal government taxes on the interest income you earn during the time you hold the bonds. Due to the fact that the Series I savings bond is a special type of bond known as a "zero coupon" (that is, you won't receive regular checks in the mail; Instead, the interest you earn is added back to the bond value, and you'll earn interest on your interest.) You have a choice between one of two taxation methods: the cash method or the accrual method. The cash method means you will only pay tax on your I bonds when you redeem them (that is, sell them back) to the United States government. If you hold your bond for 20 years, then you won't pay any tax during that period, but you'll owe a tax when you sell out of the investment. If you opt for the accrual method of taxation on your I bonds, you will pay the tax that is due on the interest you earned for the year that was added back to your principal. Expenses paid for any course that is required as a part of your degree program or certificate-granting program. The cost of books or room and board do not count as qualified expenses. The expenses must be incurred on behalf of you, your spouse, or a dependent for whom you claim an exemption on your taxes. There are several other conditions for paying no taxes on your Series I savings bonds. The I bonds must have been purchased after 1989. You must pay for the qualified education expenses in the same tax year you cash in your Series I savings bonds. You must be at least 24 years or older on the 1st day of the month in which you bought the bonds. If you were 18 years old, for instance, you wouldn't be eligible to use the Series I savings bonds to pay for you or your family's college costs; you'd still be stuck with the tax bill. If you are using your Series I savings bonds to pay for the college education of a child or other minor for whom you list as a dependent, the bonds must be registered in your name and/or the name of your spouse. You can list your child as the I bond beneficiary, but you cannot list them as the owner. Otherwise, you won't get the tax exemption on the I bonds when using them to pay for college. If you're married, you and your spouse must file a joint tax return to qualify for the Series I savings bonds tax benefits. You must meet the income limits set forth by the Treasury Department to qualify for the tax benefits of the Series I savings bonds. There are some detailed calculations to arrive at whether or not you qualify (see IRS form 8815). In 2008, the interest deduction began to phase out at $67,100 modified AGI and was completely gone at $82,100. For married joint filers, the tax benefits started to get reduced at $100,650 and were completely gone once your modified adjusted gross income exceeded $130,650. The college, vocational school, or university must meet federal assistance standards, such as the guaranteed student loan program. Otherwise, you won't get the Series I bond tax exclusion. It's important to understand that the Series I savings bond tax benefits will be reduced by the amount of any scholarships, fellowships, employer-provided educational benefits, or other tuition reduction, according to the Treasury Department. These will be deducted directly from the qualified educational expense calculation. Also, you are required to use both the principal and the interest income from your Series I savings bonds to pay qualified expenses. If the value of your bonds exceeds the amount of your qualified expenses paid during the year, the amount of interest you can exclude on your taxes is reduced pro rata. This is why you may want to consider acquiring several smaller denomination paper Series I savings bonds instead of a few larger denomination bonds. You can redeem them in smaller batches to help ensure this isn't a problem. The Series I bond tax benefits are identical to the tax benefits of Series EE savings bonds. If you own both as part of your fixed income portfolio, this should make the calculation much simpler to perform when it comes time to cash in your bonds and pay the tuition bill. 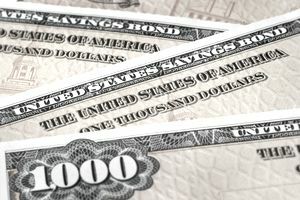 You can read our Guide to Investing in Series I Savings Bonds. This will walk you through tons of information about savings bonds, especially the series I savings bond, including how you can add them to your portfolio, annual purchase limits, ownership requirements, tax benefits, and much more.